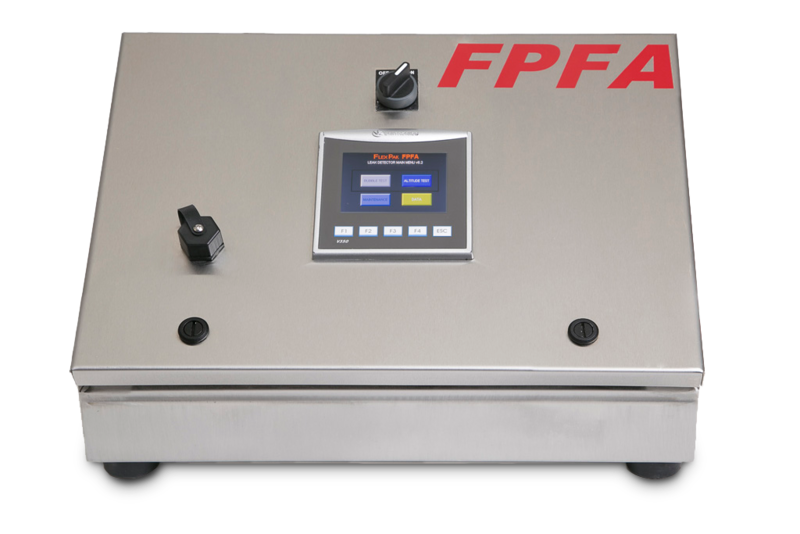 The FPFA-T provides a fully automatic control to the testing procedure of the FlexPak TM Leak Detector. It allows operators to set one or two vacuum level setpoints for the Bubble Emission Vacuum Test (per ASTM Standard Test Method D3078-02), and program each with a countdown timer for the length of time to do the test. It also enables Altitude Simulation (per ASTM Standard Test Method D6653) tests complete with input variables of ascent rate, final altitude, time at altitude and decent rate. The FPFA-T includes 50 recipe possibilities of all testing parameters and input of “lot number” or other identification for each test concluding each test to be confirmed as Pass or Fail by the operator. In addition, data for each test can be uploaded for further analysis and future reference. The only connection from the control box to the FlexPak TM Leak Detector (vacuum test unit) is an air line making the FPFA-T retrofittable to all FlexPak TM or competitors’ similar vacuum style, Bubble Test, leak detectors. Benefits of the FlexPak TM FPFA-T unit will be realized by many industries such as those in the manufacture of packaging and end user food packagers of meat, fish & seafood, cheese & dairy, confectionery, snacks, pet food & pet treats, cereals, grains & baked goods, coffee & coffee pods, medical & pharma and any non-food packaging item where package seal integrity is critical.